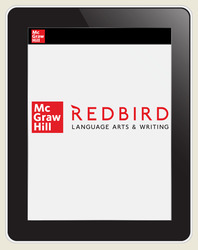 This is a 1-year, Student Edition subscription to Redbird Language Arts & Writing (priced per student). Please contact sales for multiple year subscriptions. Provides students with a richly personalized path through the curriculum, precisely delivering what each student needs to accelerate their learning. Empowers educators by freeing them from instructing and grading basic grammar and mechanics lessons, allowing time for more complex conversations about writing.